Happy Fall Ladies! 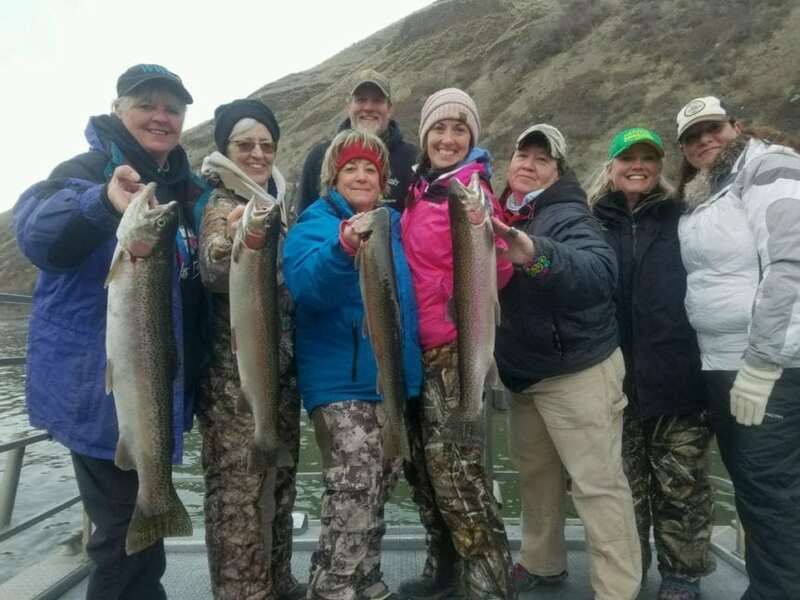 We are excited to be gearing up for the 25th Annual Women with Bait Steelhead Tournament 2019 here in Riggins, Idaho!! All you will need is your valid Idaho Fishing license, Steelhead permit, lunch, and drinks! River Adventures will furnish all the gear, tackle, bait, guide and bait boy. We will also furnish a “goody bag” for each lady with all kinds of cool stuff! We will meet at our location 122 South Main Street (across from the Chevron Station) at 7:00 am on the day of your trip., early check-in welcome. Tournament rules can be found on the website at http://hellscanyon.tours/sport-fishing/women-with-bait/. And are also listed below, please, share with your ladies. The cost for each participant is $220.00 and a minimum of 7 women are required to charter a boat for the tournament with a max of 10 per boat. Although most of you have already reserved your tournament days, we ask that you let us know ASAP if you need to make any reservation changes. We currently have a waiting list for select days and we would love to accommodate everyone. In order to secure your spot, please send in at least the first half of your tournament entry ($110/person) along with a roster list of names by mail, email, or you can call in. We require that the trip leader sends or calls in two bulk payments for the boat, first half & second half, to eliminate processing several multiple transactions. The first half of your WWB entry fee payment is due by November 5th, 2018. All reservations that haven’t paid at least the 1st deposit will be reopened for other WWB ladies. The second half will be due by January 5th, 2019. The roster is due when 2nd payment is due, so by Jan 5th, 2019! Sweatshirts will be available for purchase ~$40 ($45 for 2X and up)~ at our location. We are asking for you to turn in your sizes to us when you make payment or with your roster so it will help us in an effort to have your correct size for you when you are here. Watch our Facebook page https://www.facebook.com/RiverAdventuresInc/ and website blog for any other fun updates as we countdown to our 2019 Women With Bait Steelhead Tournament and we will see you soon! Thank you from the River Adventures Crew! Your full tournament entry fee of $220.00 per person will be due before the actual tournament day—this will eliminate any monetary transactions during sign-ups, which will get you on the river faster!! For early booked boats: 50% is due by November 5th, 2018, with the remaining 50% due by January 5th, 2019. THERE WILL BE NO EXCEPTIONS! Anyone else booking after these dates will need to pay in full upon booking. Rosters are due with the second payment, so by Jan, 5th, 2019. CANCELLATION POLICY: Tournament fees are non-refundable after 1-5-19. It’s up to you to find another participant to take your place or to take the place of a vacant spot on an already reserved boat. Steelhead will be the only legal species fished in this tournament and must at least 20″ in length. Any fish still having their adipose fin are considered to be “wild” or native, and returned into the wild as soon as physically possible, according to the Idaho State Fish and Game regulations. Please take photos very quickly! We strongly suggest all physical handling of fish, especially native fish, be left to the guide or deckhand and any handling be kept to a minimum. As the angler, you are ultimately responsible for abiding by all laws set by the Idaho Fish and Game and we suggest you acquire a set of this year’s Idaho fishing regulations and familiarize yourself with them before participating in this tournament. These regulations can be acquired anywhere you get your license and tags. When Women with Bait is over, all I can think about is next years Women with Bait! Hmmm, wonder what cool design they will have for the sweatshirts? I hope it rains, or snows just a little, to make the trip to Vinegar a little exciting that early in the morning! The best Tournament! Good luck ladies!